The lightning round talks will be a series of short (5-7 minute) presentations designed to maximize your opportunity to learn about outreach & marketing activities of your ACRL colleagues. 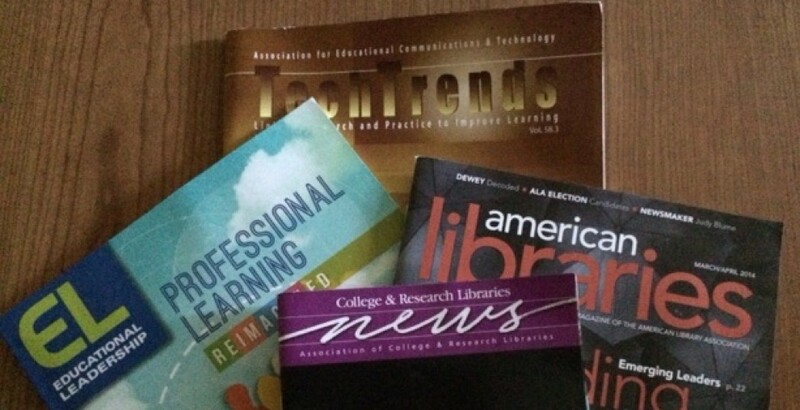 “E-Resource Round Up” column for Journal of Electronic Resources Librarianship (JERL). in-house. This would be a great opportunity for you to report on topics that may benefit others in our profession. The editors would like to receive contributions to the column by Friday, February 19, 2016. Contributions should not be published elsewhere. We’re excited to invite you to submit chapter proposals for our forthcoming ACRL book, Creative Approaches to Instructional Design in Libraries: Moving from Theory to Practical Application. Libraries increasingly emphasize innovative services that connect patrons to information. Given these changes, instructional design (ID) is becoming an important concept in librarians’ day-to-day activities. Unique, library-specific challenges call for creative ideas that are grounded in solid research and theory. Applying the theory to your institution or circumstance is often challenging. This book will attempt to break down librarians’ preconceptions of what ID is and inspire them to implement ID in creative ways. There are many variations in how different sectors understand and apply the concept of instructional design.For purposes of this book, we define it as intentional, sound instructional or programmatic creation, delivery, and assessment that takes into account the audience, course/program context, and shared learning goals. This book will have three main sections – Information Literacy Instruction, Programming and Outreach, and Online Initiatives. We welcome chapters that focus on practical and creative approaches to ID implementation. What problem were you trying to solve? What ideas did you generate to solve that problem? Who was involved? What was the result? How can the ideas be adapted beyond your library situation? Supporting ID theory and models can supplement your ideas, but should not be the focus of your proposed chapter. Don’t see your topic here? Contact the editors at CreativeIDBook@gmail.com to discuss how your idea may fit within this book’s scope. Would you like to add a peer-reviewed presentation to your CV? Looking to become more involved in regional conversations about library instruction and information literacy? We want to hear from you. Proposals are due by 5:00 pm, Monday, February 1st, 2016. Those chosen for the conference will be notified by February 15th, 2016. Proposals will be selected through a blind peer-review process. Proposals will be evaluated based on their significance and applicability to the conference theme, the quality and creativity of the work or research, the interactivity of the presentation or workshop and the potential to fill a gap in knowledge or to build on previous work. Proposals highlighting programs from different types of academic institution, community colleges, liberal arts institutions, or doctoral granting institutions are encouraged. The work or research in the proposal may either be completed or in-progress. The MILEX Conference Peer-Review sub-committee will make the selections, based on the criteria listed above. Program Details: DATE: Friday, March 18th, 2016 TIME: 9:00 a.m. to 3:00 p.m.
Join your colleagues for lively discussions about successful strategies for cross-campus collaborative initiatives that lead to student success in information literacy. Special focus will be on the first-year experience. Rebecca K. Miller, Head, Library Learning Services at Penn State University Libraries and author of Embracing the Future, American Libraries, 10/30/15, and SPEC Kit 349: Evolution of Library Liaisons, 11/15, will be the keynote speaker. A continental breakfast and a hot lunch is included. Registration will open at a later date. ($50 for members; $75 for non-members; $42.75 for students). Note: MILEX members can receive the member rate by entering the registration promotional code MILEX prior to the credit card payment screen. See our Meetings page for regular meetings with short presentations by MILEX members. calls for papers below are encouraged to contact the organizer. publishing in ways that demand a rethinking of feminist histories. experiences, words, and bodies from the field of feminist publishing? and knowledges of marginalized activist (feminist) communities? (2012) describes as “zines in third space”? art and theory, creativity and criticism? radically and revolutionarily practice decoloniality? knowledge making based on alliance, reciprocity, and relationality? The ACRL Digital Humanities Interest Group and the ACRL Digital Curation Interest Group invite presentation proposals that speak to the theme of “Engaging the Digital Humanities: Collaborating throughout the Research Lifecycle.” The selected presentations will be featured during our ACRL E-Learning Webcast on March 23. Librarians are playing ever more integral roles in the Digital Humanities research lifecycle. Librarians contribute concretely to the conception, development, dissemination, preservation, and curation of digital humanities research. These activities often require collaborations between librarians working in a diverse range of roles including but not limited to subject liaisons, digital humanities and digital scholarship librarians, metadata librarians, and digital curation librarians. We invite presentation proposals based on first-hand experiences dealing with a wide array of data formats, tools, methods, and digital platforms utilized in Digital Humanities research, and placed in the context of the latest research literature. By focusing discussion on practical challenges and solutions, it is our hope that your presentations will provide the library community with strategies that can be cross-purposed to a wide range of institutional contexts. 1. Participants will learn how to identify the stages of a Digital Humanities research project in order to better collaborate with researchers. 2. Participants will learn about the use of data in Digital Humanities research in order to identify data curation needs. 3. Participants will learn how to identify the skills they need to engage in Digital Humanities research. 4. Participants will learn how to identify Digital Humanities research collaborators in the library. Proposals are due on February 12, 2016. Notice of acceptance will be sent by February 17, 2016. If you have questions, please contact Thomas Padilla at tpadilla@mail.lib.msu.edu. Present at the 2016 NMC Summer Conference. The deadline is January 31! The NMC Summer Conference is a one-of-a-kind event, attracting hundreds of highly skilled professionals interested in the integration of emerging technologies into teaching, learning, and creative inquiry. Knowledge is power, and it is the mark of true leadership to continuously share your knowledge. The NMC community is brimming with leaders. That’s why we are tapping NMCers to uncover the most forward-thinking and provocative ideas for this year’s conference. You bring us your exciting new ideas and projects and we’ll set the stage for them by throwing an incredible event! NMC Summer Conference presenters are thought leaders within the education industry at higher education institutions, schools, museums, libraries, organizations, and corporations. They are the people pushing the envelope to infuse innovation and creativity into learning experiences worldwide. That’s YOU! The NMC invites all change agents within learning-focused institutions and organizations. The annual event regularly attracts university CIOs and CTOs, faculty, technologists, K-12 administrators, education policymakers, and museum and library leaders, as well as education innovators across major corporations. What is the Focus of the Presentations? The NMC Summer Conference pathways, or “themes,” align with the priorities of our member community; this year’s sessions will focus on the most pressing trends, approaches, and topics among innovators in the field. The six pathways are Creativity and Making, Digital Strategies, Online and Hybrid Learning Innovation, Personalized Learning, Rethinking Traditional Roles, and Technology Futures. BEFORE YOU SUBMIT Read the official proposal guidelines. Have questions? Contactnancy@nmc.org. The deadline to submit your proposal is January 31, 2016. Are you interested in presenting on Library Marketing & Outreach at the ALA Annual Conference? Submit a proposal to the Library Marketing & Outreach Interest Group! We are looking for three 15 minute lightning presentations for our annual meeting. Topics should include Library Marketing and/or Outreach in Academics. Proposals should be submitted no later than March 15th. After this time, the ACRL Library Marketing & Outreach IG members will have a chance to review your proposal and vote for their favorites. The three selected presentations will be announced by the end of March. For the forthcoming Seneca Falls Dialogues on Gender, Economics, and Enterprise (to be held in Seneca Falls, NY between October 21-23, 2016), I am assembling a session on the theme of “Fashion, Economics, and Social Justice.” Sessions at the Dialogues are a unique blend of research presentations, and active discussion with conference attendees. • -How does (and has) the fashion industry worked as a site of national and global economic empowerment and oppression for (especially female) workers? How have (and do) workers labor within, and work to resist, these hierarchical economic structures? • – How have (especially female) workers and allies created movements for economic justice within the fashion and garment industries, and what have some of the complexities and challenges of building and sustaining these movements been? • -How has (especially women’s) work in the fashion and garment industries been represented in popular culture and media? What has been valuable and problematic about these representations? For the Dialogues, my own remarks will focus on how I have taught issues of class, labor, and social justice in my course in the history of fashion in the United States, and some of the challenges and insights I have encountered and gained from so doing. http://senecafallsdialogues.com/about/call-for-dialogues-page/call-for-dialogues/, and please address any questions to me at hkent3@uis.edu<mailto:hkent3@uis.edu>.